When it comes to website tracking accuracy, Google Analytics is far the best tool out there. There's no question in this matter? Or is there? Maybe. Google Analytics does have limitations. It provide limited information in some cases. While analyzing the stats of your site on Analytics, you might noticed there's referral search queries for your site that are 'not provided'. Go to Analytics, on the left sidebar menu, click on Acquisition tab. Below the 'Campaign' tab, follow the Keywords > Organic. You'll be presented with the list of keywords that people use to find your site through search engines. But, did you notice something odd? Why there's something called 'not provided' on top of those keywords? And why does it have the highest number of visits to your site? Those are actually the keywords that visitors use to find your blog through search engines. So, why Google won't show all these keywords? Simply because it doesn't want you to manipulate Google and take all the traffic. You might wanna keep in mind that these 'not provided' or we can call the 'hidden keywords' have the highest potential to rank your site #1 in Google. What does that mean? Well that means, you're on the first page for the keyword that people use to get into your site. This means more organic traffic which eventually leads to maximum revenue! Okay, that sounds very cool. But how do youget to first page when you even don't know what keywords are hidden behind the Google Analytics' 'not provided' term? I've found one simple solution for this problem. HitTail. HitTail is a search engine optimization tool that simply provides you the long tail keywords that your visitors use to reach to your site through search engines. 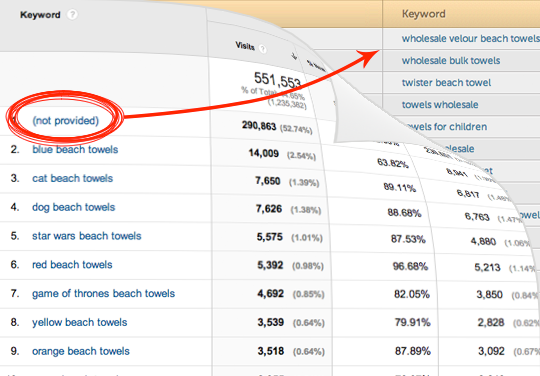 To be more precise, it shows you the search queries that Google Analytics don't. How does HitTail help increase search engine traffic? As you might have already guessed, HitTail reveals you the 'gold keywords' that have very high potential to rank on the first page or even #1. And there's not one 'gold keywords', there are hundreds of them! HitTail's tracking system analyzes your site and lists out the keywords that your visitors use to get to your site. Basically, all the keywords that HiTail provide has very low competition and is easier to rank. You can create a dedicated post for one of the applicable keyword and with little effort your site can rank on the first page. In the other hand, HitTail also have other options like 'Keyword Suggestion' that you can use in existing post to increase relevancy. This way your post can look more relevant and it's very likely to rank higher! HitTail is a simple but a very powerful tool that. It's very easy to use. It can bring you hundreds or even thousands of targeted visitors to your site and maximize your revenue. Personally, yes, I highly recommend this tool. How much does it cost to you? HiTail offers four plans. Personal, Pro, Business and Agency for the monthly charge of $9.95, $19.95, $39.95 and $79.95 respectively. However, you can sign up for HitTail and receive up to 15 suggestions for your site. If you're satisfied enough, you can upgrade to the premium version. Sign up for HitTail now!